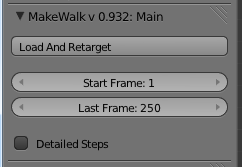 The user interface of MakeWalk is located in under the Armature tab, and becomes visible when an armature is selected. It consists of six panels; the first one is open by default and the others are closed. 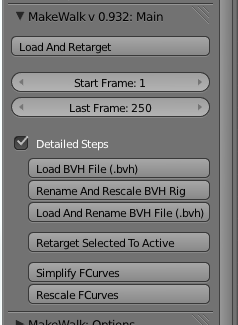 Load And Retarget: Select a BVH file and retarget it to the active armature. Start Frame: The first frame in the BVH file to considered. Load BVH File (.bvh). Load a BVH file, and create an animated armature from it. Rename And Rescale BVH Rig. With the BVH armature active, and a target armature selected, rename and rescale the bones of the active armature to fit the target. Load And Rename BVH File (.bvh). A combination of the previous two buttons. With a target armature active, load a BVH file, and create an animated armature with renamed and rescaled bones. Retarget Selected To Active. Retarget the animation from a renamed and rescaled BVH armature to the active armature. Simplify FCurves. Simplify the F-curves of the active armature. Rescale FCurves. Rescale F-curevs of the active armature. MakeWalk is designed to retarget animations to a given armature with a minimum of user intervention. However, retargeting is a complex process, and entirely automatic retargeting may fail or result in suboptimal motion. Information about how to identify and correct problems is found in Errors and Corrective Actions. A common problem is that automatic identification of bones in the target armature fails. A bone map can then be assigned manually, cf. Defining the Target Rig Manually.